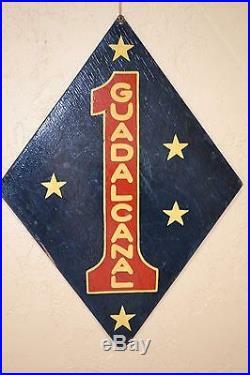 Fabulous WWII Guadalcanal Marine Raider wall plaque. Measures 20" across x 27" tall. Hand made from 1/4 plywood and hand painted and varnished. In very good condition, one chip on left and bottom front and a few surface scratches. This is from an estate of a WWII Marine Raider from Oregon. Origin and artist of the piece are both unknown. The hand made nature of this piece makes me think it is a one of a kind. A great piece for any militaria collector. The item "WWII Marine, Raiders, Guadacanal wall plaque, vintage hand made piece" is in sale since Monday, March 27, 2017. This item is in the category "Collectibles\Militaria\WW II (1939-45)\Original Period Items\United States\Medals & Ribbons". 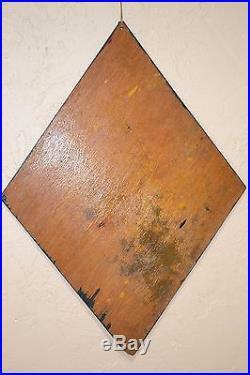 The seller is "furnacegeek" and is located in Sisters, Oregon. This item can be shipped to United States.